I climbed Lone Peak with a group from SummitPost last Saturday, almost exactly a year after I climbed the east ridge of the Pfeifferhorn with a group from the site last year, and a little over two years after I climbed Lone Peak in the summer with my friend Hyrum. Lone Peak sits right on the border of Utah and Salt Lake Counties, and last weekend's clear weather offered amazing views of the valleys all the way from Ogden to Nephi. 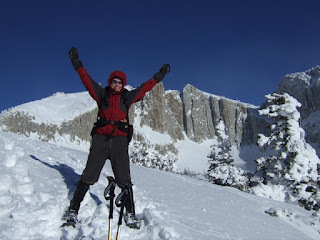 The climb was a 13-hour, 6.5-mile (one way) snowshoe hike, with a technical snow and rock ridge climb at the end. Thankfully, we joined up with a group from the Wasatch Mountain Club early in our hike, so there were lots of people available to take turns breaking trail. We were making fresh tracks through deep snow the whole way. 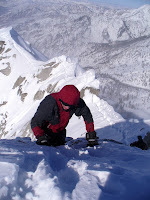 We faced high winds on several sections of the ridge that we climbed. The blowing snow and sun made for some beautiful pictures, but my face and neck felt like they had been sandblasted by the time I got back to the trailhead. The knife-edge ridge at the top was the most fun part of the hike. We crossed on a narrow band of snow punctuated by two large rocks, and topped off by a rock chimney. 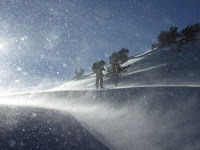 On one side was a sheer face of snow, and on the other was a 50-foot section of 40º snow terminated by sheer rock cliffs. A mistake on the ridge would have had drastic consequences, so we all (except for one crazy guy...) carried ice axes for self-belay while climbing, and for self arrest in case of a fall. 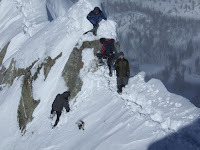 In one section we had to climb up over a big rock and then jump down four or five feet onto a narrow band of snow that sank a little every time someone jumped down onto it. That section proved to be pretty tricky to get back over on the way back, requiring a partner assist. I got a little over three hours of sleep the night before the climb. I left Provo around 4 a.m., and we left the trailhead in Draper around 6 a.m. By the time I got back down to the trailhead around 7 p.m., I was completely exhausted. Thankfully, I carpooled with another climber, so I didn't have to drive back to Provo. I hit the sack soon after I got back to my apartment and didn't wake up for 13 hours. That's the longest I've slept in a long time. Bruce, I'll be as active as possible this winter and spring, so if you ever need partners just contact me through SP or my blog. 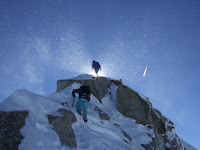 I plan on doing Lone Peak again in January--how about you? I'll be moving to California in January, so I won't be climbing much around here next year. I may do a climb or two in early January, though.